"The enemy of Investment Success isn't lack of knowledge – it is fear." – Nick Murray author of Simple Wealth, Inevitable Wealth: How you and your financial advisor can grow your fortune in stock mutual funds. With the constant volatility of the markets, some investors may question how to react. As the above quote notes, fear is the most dangerous emotion an investor can have. Fear is what makes investors panic and sell when they are down on a position and what stops them from buying when the markets are offering the strongest growth opportunities. Keeping a long-term view can help you survive the markets ups and downs and benefit the most when opportunities present themselves. When markets decline, it's easy to forget all the times they've gone up – and up. The Toronto Stock Exchange (TSE) 300 Index for example has registered almost twice as many up years as down years. In fact, since 1920, the TSE has posted positive annual returns for 53 years*. Additionally, investors in the TSE have enjoyed double-digit returns in 35 out of 80 years, and returns greater than 20 percent in 22 out of 80 years since 1920. Of course, there have also been periods of decline. The TSE's 27 down years averaged a negative 12.21% percent return – yet the 53 up years averaged a positive 17.19 per cent return. The moral of this story? Over time, markets have dipped, but they've also shown a remarkably consistent upward trend. So whenever you tune in to news on market movements, try not to focus on the short-term: remember what history has shown and stay focused on your long-term goals. Ongoing market cycles will also create predictable emotional cycles. As the chart below outlines, upward market trends create a sense of optimism, flat markets bring feeling of denial and sharp declines can bring on fear and depression. Once markets normalize again, we all feel a renewed sense of hope. There's no question about it, investing is an emotional experience. 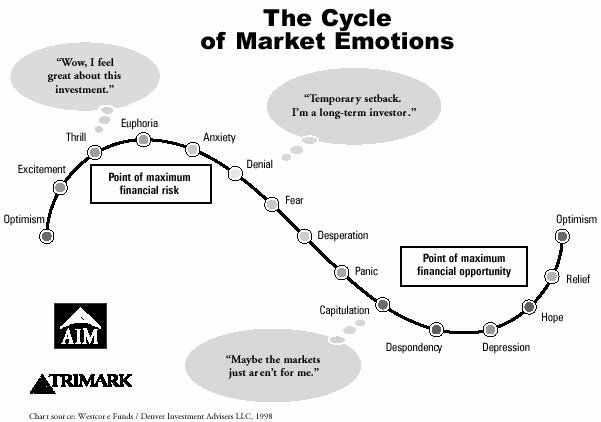 Yet knowledge is a powerful thing: simply by knowing that we all go through a range of emotions each time the market goes through a cycle can help us take a more rational (and less emotional) approach to market volatility. One thing is for sure: markets will always go up and down. However, by maintaining a long-term perspective and by having a better understanding of the range of emotions that investing can create, you'll be better prepared for one of life's uncertainties. In conclusion, don't let your emotions rule your investment decisions. It is important to keep your sense of perspective, buy and sell decisions should be based on long-term strategies such as asset allocations and style diversification and not on market fluctuations. Downturns in the market are a fact of life, but over the long-term, the stock market has proven to be a key component of successful investment plans. * The information in this article references annual returns of the Toronto Stock Exchange 300 Index from 1920-1999. TSE 300 Index is a weighted index of 300 of the largest, most widely held stocks traded on the TSE and is commonly used as a benchmark to measure the price performance of the broad Canadian equity market. http://joshuasowin.com/archives/2008/03/17/eight-steps-to-seven-figures-by-charles-carlson/ - Book Review of 'The Eight Steps to Seven Figures' by Charles B. Carlson. www.globefund.com - Want to learn more about your mutual funds on your own time? Globefund (set up by The Globe and Mail) offers summaries of most mutual funds. Including returns, fund objectives and top ten positions. If you are interested in more sites, visit www.managedmoneyreporter.com/links. Win a Free Copy of Quicken Software! 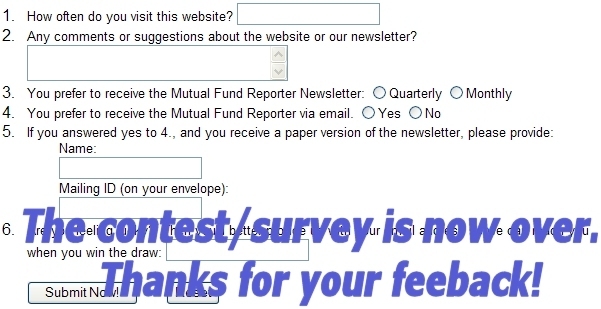 Please complete the following survey by June 30th to be entered in a draw to win a free copy of Quicken Financial software. By using this method of delivering the �Investment Options' to our readers, you are now able to zoom in on any section of the fund listings eliminating the most common comment, that with the many new funds available, the lines of text have become too small. If you do not have access to the Internet and would like us to send you a copy of our recommended list, please call us at 1-800-387-9273. We will also keep you posted on any changes we make to the list through this newsletter. AGF has proposed many mergers of Global Strategy Funds into existing AGF Funds. Most notably, Global Strategy Income Plus into AGF Canadian Balanced Fund and Global Strategy Growth and Income into AGF Canadian Stock Fund.